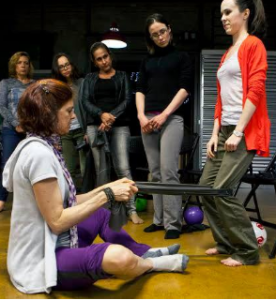 This workshop will focus on the anatomy of the body known as the “Core”, learning how to engage and control muscles of the pelvic floor and the Deep Core (including muscles that stabilize the vertebrae; and other muscles like the psoas, iliacus, and quadratus lumborum). Why strengthen your pelvic floor and deep core? Pelvic floor dysfunction can cause more problems than incontinence. It can also affect the lower back, sacroiliac joint, hip joint, prolapses, sexual dysfunction, etc. Learning anatomy is fun and interesting and will include the use of props, hands-on cueing, and modifications!